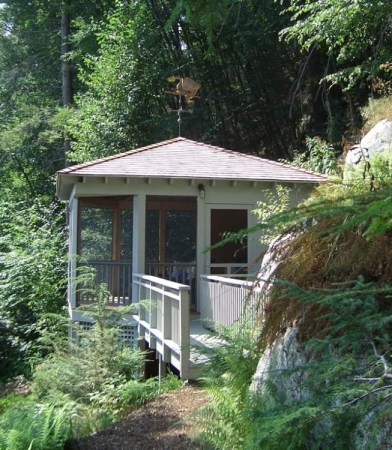 Our Dragon Weathervanes are among our most spectacular weathervane offerings. This copper Fire Breathing Dragon Weather Vane has translucent red glass eyes, although we have also made green-eyed dragons, blue-eyed dragons and emerald-eyed dragons. The flames featured in this particular weather vane are made of alternating sheets of copper and brass. For the horns, teeth, talons and spines our customer selected optional gilding with 23-carat gold leaf. In addition to the Fire Breathing Dragon Weather Vane, we also offer a Web Winged Dragon Weather Vane. We have crafted this Fire Breathing Dragon in combination with both St. George and with St. Michael, the brave knight rearing up on his steed as he faces his fierce fire breathing nemesis. Highly detailed combination sculpture pieces such as these shows better in our larger sizes. One of my favorite variations on this theme was to put one of our fire breathing dragon weathervanes on a separate stand with a St. George Weathervane nearby, also on its own stand. When the wind blew one way, St. George chased his dragon, but when the wind shifted the dragon got his chance to chase St. George! And to add to the fun, the customer’s name was George. His wife, an avid dragon fan, is the one who suggested the two separate side-by-side weathervanes. That way, she would get a chance to root for her dragon. at least part of the time! 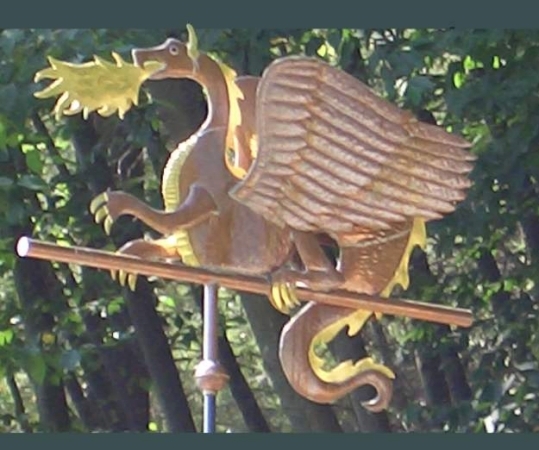 West Coast Weather Vanes specializes in custom copper weathervanes and, being dragon fans ourselves, would love to hear from you if you have your own ideas for a new dragon weathervane. There are two distinct threads of dragons in the world: the European, derived from European folk traditions and ultimately related to Greek and Middle Eastern mythologies, and the Chinese, with counterparts in Japan, Korea and other East Asian countries. On several occasions our dragon weather vanes have been purchased as a birthday gift for people born in the Year of the Dragon. According to the Chinese Zodiac auspicious years for dragons are 1928, 1940, 1952, 1964, 1976, 1988, 2000, 2012, and 2024. 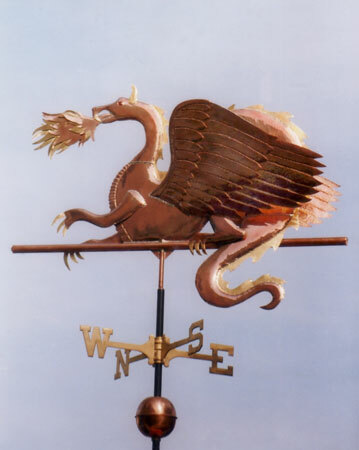 Whether you like our existing dragons, or have a vision of your own, some of our best weathervanes are the result of ideas brought to us by our customers. And, as a fan of large reptilian-like creatures, be sure and check out our dinosaur weathervanes and Godzilla Weathervane for inspiration.